I would like to assure my readers that I actually do still read real books-in-your-hand primarily. It was just the trip overseas (to bring home Bookworm 4) which flew me (literally) into the ebook world. It was a necessity. But now that I'm home, I'm smelling the pages again. Please rest assured that I think books in the hand are the primary way to go. Right before our "pick up" trip, I received an e-mail with the upcoming releases from Crossway and the title Women of the Word caught my eye. This year it has been my goal to read the Bible through chronologically and I've been spending my morning wake up minutes focused on that. Books, as you all know, are incredibly important to me but it has been a challenge to me to make the most important book in the entire world a top priority.This year I'm working on changing that and sticking to a daily reading plan. So far so good but I'm not going to deny that it is a struggle. I tend to pick up books about the Bible more quickly and easily than the Bible itself. I know this tendency is a weakness of mine and I'm focused on correcting it at present. That explained, I really wanted to read Women of the Word so I signed up to review the title on a screen. Despite my hesitations on the medium used to read this book, I do think it was terribly worth it. This next statement is going to sound rather funny but bear with me and read beyond it: I think Jen Wilkin has a boring reading voice. It's not exciting in the least; it's just straight forward and to the point. And you know what? That's precisely what this book needed to be. Wilkin didn't need to fill this book about how she studies the Bible with lots of funny stories and clever little anecdotes from her own life to instruct her readership to improve their Bible reading. She needed to do exactly what she did, which was to focus on the how and the why of Bible study. She did this job remarkably well and gave me plenty of things to mull over as I continue to try to understand the Word of God, who God is, and what my life needs to look like in response to what I learn. Yes, she does tell a personal story or two but the focus of the book is definitely not on her but on developing an appropriate and useful Bible study method which will increase your Biblical literacy. So when I say she has a boring reading voice when it comes to this book, I actually mean that as a compliment. She doesn't distract from her message by telling me about herself. I appreciated that and that is the main reason why I think Women of the Word is actually quite the useful tool and worthy of a good read. As women and mothers, we all know that it can be so easy to focus our time and attention on things other than learning more about the Bible. We think we're short on time to focus on the Bible in any sort of scholarly way and I think we have a tendency to give up before we even get started. We are pretty quick to shrug our shoulders and assume that there are so many people more qualified to read and understand these words from the Lord than we ourselves. But the thing of it is, the Bible was written for all of us - man, woman and child. It is a book for all of the people of God - not just scholars, not just men, and not just retirees. It was written for me at age 2, it is written for me at age 35, and it will be written for me at every age that I ever am. It is given to me to grow in the knowledge and love of the Lord and it is very important that I not ignore it. "Do you believe in the importance of reclaiming Bible literacy? Let me suggest a reason why you should: Bible literacy matters because it protects us from falling into error. Both the false teacher and the secular humanist rely on biblical ignorance for their messages to take root, and the modern church has proven fertile ground for those messages. Because we do not know our Bibles, we crumble at the most basic challenges to our worldview. Disillusionment and apathy eat away at our ranks. Women, in particular, are leaving the church in unprecedented numbers. Wilkin spends a lot of time encouraging her readers - all while giving them straight forward advice as to how they can improve their knowledge and understanding - to stick to it. Whatever time you have to spend in God's word - spend it! Glean, learn, read, re-read, pray, research, GROW! Growth in her readers' love of the Lord is definitely the main focus of Wilkin's book and I accepted that encouragement to keep on keeping on. I particularly love that she encourages readers of the Bible to make notes of the passages they do not understand, confess the limits of their understanding, and accept with joy their ignorance while praying and trusting God to reveal any mysteries to them in time. It can be overwhelming to read a difficult passage (I personally think of Ecclesiastes and Revelation) and feel yourself inadequate. Instead of feeling ashamed by my lack of understanding, Wilkin offers practical suggestions to grow in one's understanding as well as assurance that even in the weakness of ignorance, God's strength can be shown. I really do believe that this is an extremely useful book which offers tools for anyone to use in reading, understanding and applying scripture. Although this book is written specifically for women, her tips can be applied across the board. Why? Again, because God's word is written for all people in all places. It is to be studied by each one of us, without exception. If you are struggling to read for understanding and a deeper knowledge then I highly encourage you to pick up a copy of Women of the Word . I found it to be outstanding. I am happy to say that Crossway Books has offered to give away TWO copies of this book to two of my readers here at Reading to Know. This contest is open to U.S. AND Canadian residents and will be open through Monday, June 23rd. Simply leave a comment to be entered in the drawing, including a valid e-mail address. Many thanks to Crossway Books who provided a copy of this book (on the screen) in order to facilitate this review. Thanks also for their willingness to spread the joy which this book brings by offering two copies to my readers here. I did her James' Bible study and it was fantastic. No frills- just God's word. I'd love to win this. I would love to win a copy! Sounds like a really great book. Oh, and can I just say "Thank you" for doing giveaways the old-fashioned way without 10 steps to qualify?! Sounds like a great book! I too have a hard time reading the Bible sometimes, rather than reading ABOUT the Bible. I find it helpful to occasionally pick up a new-to-me translation. Then it moves my brain out of the "I've read this before" into "oh! I didn't realize this verse said that. Let me compare to my good ole KJV. Yup! It does say that!" It's refreshing once in awhile to mix it up. What is it that makes reading the Bible harder than a book? I think this sounds like an incredible and timely book for me. 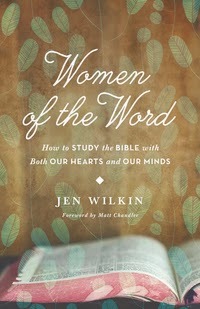 Looking forward to seeking out Jen Wilkin's other books, too. and...thissimplemom at gmail dot com to follow the rules. She stole my title! Just kidding. :-) I've had a column by that name in a ladies' newsletter for two different churches over a span of about 12 years and have given some thought to seeing if they might form a book. If I ever do, I'll have to come up with a different title. :-) This is a passion of mine, so I'd love to win this. My e-mail is barbarah06 (at) gmail (dot) com. Would love to win a copy. Anything to make reading the bible easier😊. This is also a passion of mine and I am always interested in finding new resources to share with others (particularly those who are intimidated by the Scriptures.) This sounds like a good one. I am soooo excited that this book giveaway is open to us Canucks! This book is on my list but I couldn't find it at the book store on the weekend. Thanks for the giveaway! Really excited for a chance to win a copy of this one because this is an area where I need vast improvement and I don't know where to start! It sounds very interesting, and I would love to read it. Thanks for having the giveaway.